Background: Thiopurine S-methyltransferase (TPMT) enzyme metabolizes thiopurine drugs which are widely used in various disciplines as well as in leukemias. 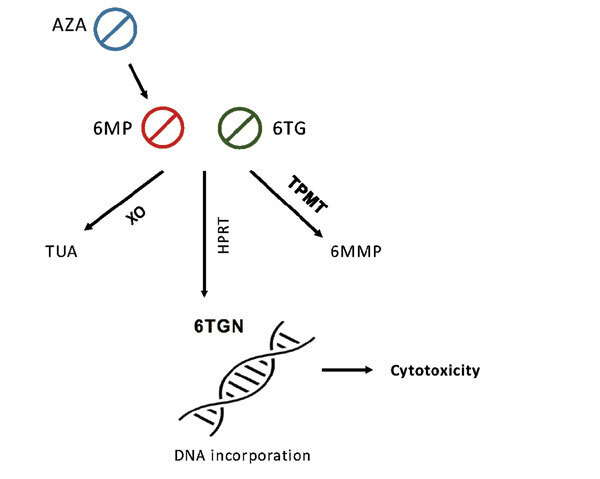 Individual enzyme activity varies depending on the genetic polymorphisms of TPMT gene located at chromosome 6. Up to 14% of population is known to have a decreased enzyme activity, and if treated with standard doses of thiopurines, these individuals are at a high risk of severe Adverse Drug Reactions (ADR) as myelosuppression, gastrointestinal intolerance, pancreatitis and hypersensitivity. However, TPMT-deficient patients can successfully be treated with decreased thiopurine doses if enzyme status is identified by a prior testing. TPMT status identification is a pioneering experience in application of pharmacogenetic testing in clinical settings. 4 TPMT (*2, *3A, *3B, *3C) alleles are known to account for 80-95% of a decreased enzyme activity, and therefore, identifying the presence of these alleles supported by phenotypic measurement of the enzyme activity can reveal patient’s TPMT status. Evaluation of the levels of thiopurine metabolites further supports the practice of appropriate dose adjustment by providing the efficient monitoring of drug cytotoxicity. Conclusion: We hereby review the thiopurine pharmacogenetics and the methods applied in common practice to evaluate patient’s TPMT status. Thiopurine methyltransferase, pharmacogenetics, azathioprine, 6-mercapturine, 6-thioguanine, TPMT testing.